The Redskins led all day, but Odell Beckham, Jr.’s diving, one-handed touchdown catch from Eli Manning with 4:57 left drew the Giants within a touchdown, prompting nerves from all in attendance. But the Redskins were able to churn out a couple of first downs — via Alfred Morris — and when the Giants got the ball back with just 19 seconds left, there was little they could do — though a hook-and-lateral on the last play at least made the final play fun to watch. The Giants received the ball first and had already methodically drove into Redskins territory before Washington was able to force a third-and-11. Eli Manning threw to Shane Vereen in the flat but the ex-Patriots back started running before securing the ball and after a couple of deflections, Perry Riley Jr. was able to corral the pigskin for an interception. Cousins and the offense had a quick three-and-out when Jamison Crowder could not hang on to a rainbow pass on third down. Both sides did it all over again on the next set of possessions when Eli targeted ex-Cowboy Dwayne Harris down the right sidelines. Will Blackmon was on the coverage and allowed Harris to get his hands on the ball before Kyshoen Jarrett, playing safety, came over the top for a clean legal yet hard hit to dislodge the football. Blackmon stuck with the play and laid out for the Redskins’ second pick of the ball game. However, a Jordan Reed holding penalty stalled the ensuing drive as soon as it began and after Dustin Hopkins had his 51-yard field goal attempt partially blocked, Washington came away with zero points off two Giants turnovers. 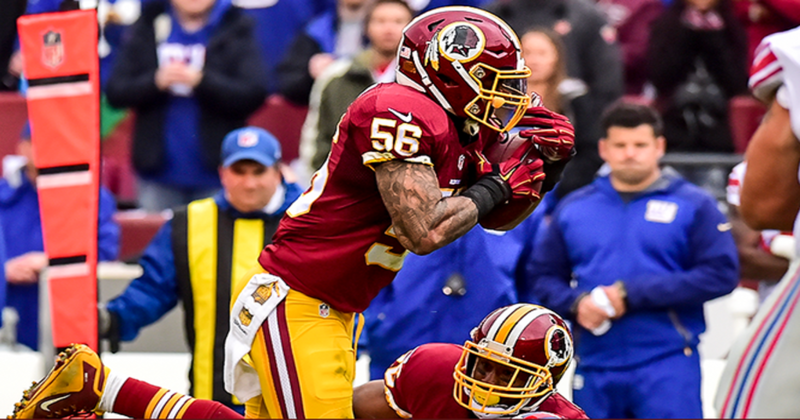 The Redskins defense continued to get it done though as they took full advantage of a holding penalty against New York to force a punt after the Giants had drove into plus territory. Again, two more penalties on Jordan Reed and another on Morgan Moses stalled Washington when they had to face a second-and-30. Luckily, a few conservative play calls following the penalties set up a manageable 41-yard field goal for Dustin Hopkins to give the Redskins a second quarter lead. 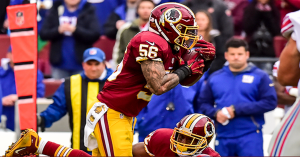 After the Washington defense forced another punt, this time after a three-and-out because of a Ryan Kerrigan sack, Sean McVay decided to target Jayron Hosley, Dominique Rodgers-Cromartie’s replacement, and former Redskins safety Brandon Merriweather. On an up-and-in pattern for the Redskins, DeSean Jackson out ran the defense and perfectly adjusted to Cousins’ deep ball before walking in for a Washington touchdown. Joe Barry‘s defense stuck to their track record of standing tall after giving up a few yards that flipped field position. That happened twice to sandwich a Washington three-and-out. When Cousins got the ball back, the Redskins reverted back to the screen game success they had against the Saints to open the drive. Great blocking from Brandon Scherff and company against the perfect defense allowed Matt Jones to rumble down the field for a 45-yard gain. After Alfred Morris got just enough on third-and-1 for a conversion on individual effort, Jordan Reed started to work off his earlier penalties with a 20-yard gain to set up the Redskins in a goal-to-go situation. After a surprising overruling of a Jamison Crowder touchdown, Gruden rolled the dice on fourth down from six inches out and Cousins was able to break the plane with the football for another touchdown. The defense held off the Giants offense again before the half with Bashaud Breeland shutting down Odell Beckham Jr. When the Redskins were headed to the locker room up 17-0, they received a standing ovation from the fans at FedEx Field for their efforts. Washington looked to put the dagger in the Giants on their opening possession of the half with a 26-yard pass play to Jordan Reed. 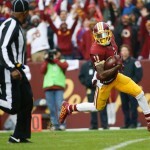 However, the drive stalled when the Redskins were faced with a fourth-and-1 from the New York 35. Gruden bypassed the chance at a 53-yard field goal attempt in drizzling conditions, but Cousins fumbled the hand-off to Darrel Young, resulting in a turnover on downs. Manning finally started to connect with Odell Beckham down the field for gains of 13 and 31 yards in decent defense from the Redskins corners. Luckily, the Redskins defense on third down continued to show up big. Manning had plenty of time on a third-and-goal play from the four yard line. With Chris Culliver (knee) and DeShazor Everett (hamstring) sidelined, converted wide receiver Quinton Dunbar saw time at nickel corner where he was faced up against Rueben Randle on this occasion. Dunbar closely followed Randle towards the back of the end zone and undercut the route for Washington’s third interception of the game. Following a Redskins punt that was able to flip field position, Perry Fewell‘s undermanned secondary continued to play at a high level. Blackmon, twice, and Dunbar got pass deflections to force three straight Eli Manning incompletions, and yet another punt. After Cousins went three-and-out, the Redskins front seven picked up the pace. Rookie Preston Smith put pressure on Manning to force a throw-away two plays before Kerrigan worked through a holding foul on Marshall Newhouse to get his second sack of the game. Headed into the fourth quarter, Washington was already in Giants territory looking for the dagger score. Morris continued to run hard with 25 yards on the drive — much of it due to individual effort by moving the pile. Unfortunately, the former sixth-round pick needed a breather and Matt Jones was unable to convert on a third-and-2 play. Hopkins was true from 33 yards out to give Washington a 20-0 lead with 11:36 left in the game. Manning hit Beckham over the middle for another 31-yard gain to set up the G-men at the Redskins 34 following a DeAngelo Hall horse-collar penalty. Even after a sack from Chris Baker, the Giants opted to go for it on fourth-and-16y. With Dunbar out of the game with a finger injury sustained on his earlier pass deflection, Blackmon was matched up on Rueben Randle and turned him loose expecting safety help. Manning did not miss his secondary option and the Giants were back in it at 20-7. After picking up one first down, Washington was unable to pick up another when Reed was tackled short of the line to gain by rookie Landon Collins. Manning had the ball back and did damage with Will Tye for 16 and 28 yards, the latter coming on a fourth-and-2 down. Three plays later, on a third-and-2 play, Manning seemed to have led Beckham too far in the end zone, but the LSU product added another catch to his highlight reel with a diving, one-handed catch. FedEx Field was awfully quiet when Washington faced a third-and-5 with fear of going three-and-out and giving complete momentum to the Giants. Cousins stayed collected in the pocket and fired a dart to Reed over the middle after he shook his safety defender to break open. Alfred Morris came through with runs of six and seven yards against a Giants front that was playing the run. After burning all of their timeouts, the Giants got the ball back with 19 seconds on the clock at their own 16-yard line. 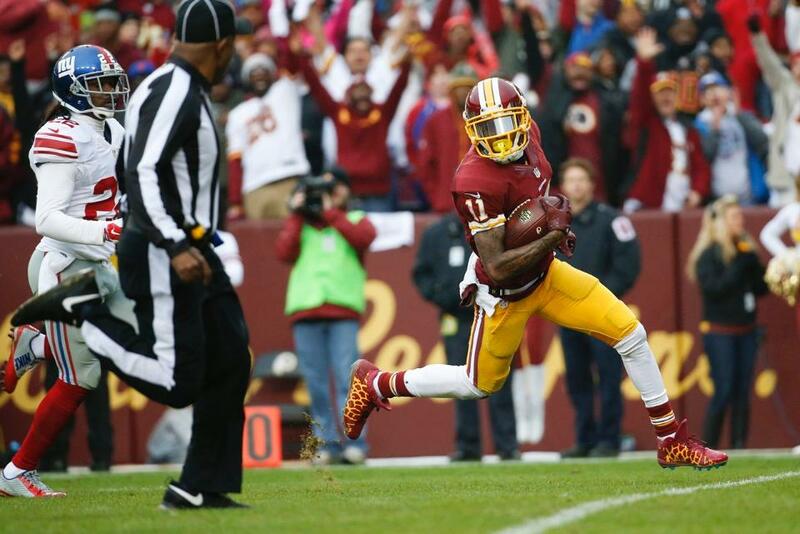 After a hook-and-lateral ended in a fumble out of bounds, the Washington Redskins were victorious 20-14.